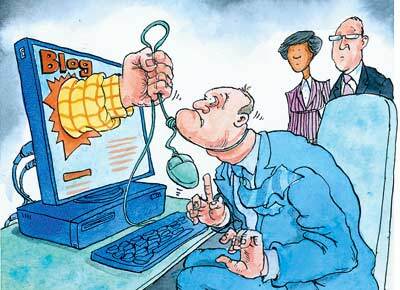 Two articles appeared recently in The Economist about blogs. The texts of both of them are included in this posting. There is not much said that is new or outstanding, more analysis of the continued fragmentation of media. Savvy corporations must make the investment to monitor the blogosphere as they do other forms of media. What are customers saying? What must we do to keep our image spotless and clean? How do we take advantage of this media channel to increase brand loyalty and reach new customers? Are these the customers we want to appeal to in the first place? THEY have always had their critics, but corporations are having an especially hard time making friends of late. Scandals at Enron and WorldCom destroyed thousands of employees' livelihoods, raised hackles about bosses' pay and cast doubt on the reliability of companies' accounts; labour groups and environmental activists are finding new ways to co-ordinate their attacks on business; and big companies such as McDonald's and Wal-Mart have found themselves the targets of scathing films. But those are just the enemies that companies can see. Even more troubling for many managers is dealing with their critics onlineÂbecause, in the ether, they have little idea who the attackers are. The spread of Âsocial mediaÂ across the internetÂsuch as online discussion groups, e-mailing lists and blogsÂhas brought forth a new breed of brand assassin, who can materialise from nowhere and savage a firm's reputation. Often the assault is warranted; sometimes it is not. But accuracy is not necessarily the issue. One of the main reasons that executives find bloggers so very challenging is because, unlike other ÂstakeholdersÂ, they rarely belong to well-organised groups. That makes them harder to identify, appease and control. When a company is dealing directly with a labour union or an environmental outfit, its top brass often take the easy route, by co-opting the leaders or paying some sort of Danegeld. Until a couple of decades ago, that meant doling out generous union contracts and sticking shareholders, taxpayers or consumers with the bill. More recently, the fashion has been for Âcorporate social responsibilityÂ. This might involve spending money on a pressure group's pet project; or recruiting prominent activists to a joint committee, dedicated to doing good works. In the blogosphere, however, a corporation's next big critic could be anyone. He might be an angry customer or a disgruntled employeeÂthough that sort of tie to the company is not essential; nor does he need lots of industry experience or lengthy credentials to be a threat. All a blogger really needs to devastate a company is a bit of information and plausibility, a complaint that catches the imagination and a knack for making others care about his gripe. Mike Kaltschnee's site, HackingNetflix.com, became a force to be reckoned with for Netflix, a video-rental outfit that delivers to people's homes. When Netflix said it was not interested in Mr Kaltschnee passing on questions from consumers, he posted the exchange online, hurting the firm's reputation among loyal customers. The company now treats him much more respectfully and his site has gained a large following. One firm that could have saved itself a lot of trouble is Diebold, an Ohio-based firm that makes automated cash machines. After America's presidential election in 2000, which featured a vote-counting fiasco in Florida, the firm decided to expand a part of its business that made electronic voting machines by acquiring Global Election Systems (GES) in early 2002. The deal turned into a disaster when computer scientists and voting-rights groups educated the public about problems with machines such as those made by GES. The critics complained that GES's voting devices could not leave an audit trail because, among other flaws, they did not print paper ballots. By 2004 the mainstream print and broadcast media were also hammering away on this issue, leading several states, including Ohio, to reject GES's machines. Evolve24, a consultancy which analyses corporate reputations and watches online trends closely, has used its blog-sniffing software to find out what was available on the internet before Diebold bought GES. It discovered that not only were a couple of voting-rights activists calling attention to the machines' drawbacks on their blogs well before the acquisition, but also that research papers highlighting the problems were available on technical websites. Diebold did traditional forms of due diligence before buying GES, such as verifying its financial health. But by ignoring the blogosphere, it failed to spot some crucial risks. Although its response was much quicker than Diebold's, Kryptonite, a firm that makes high-priced bicycle locks, also learned the hard way how important blogs can be. In September 2004 word spread quickly through the blogosphere that U-shaped locks by Kryptonite and other firms could be picked, quickly and easily, using only the plastic casing of a Bic pen. Then somebody made a video showing how to do it, and posted it on the Engadget blog site, one of the most popular on the internet. After Kryptonite discovered the problem, it came up with a plan to take care of its customers and improve its locks. But Donna Tocci, Kryptonite's media chief, says that she now checks 30-40 blogs every day. Not all company interactions with bloggers involve damaging criticism. Sometimes a careful look at what is happening online can help managers to avoid over-reacting. After the invasion of Iraq, when American consumers turned against all things French, a big French drinks company noticed that its brand names were popping up on boycott lists. But an analysis by BuzzMetrics, which specialises in scrutinising blogs and other online forums for corporate marketers, revealed that those who were pushing hard for a boycott tended to be ÂBudweiser drinkersÂ, who would not have been natural customers for the firm's wines and spirits anyway. Many big companies have been looking eagerly for ways to tailor their advertising to specific groups of consumers. They have found that web logs and internet discussion groups, which bring together people of similar interests, can help them turn hot links into cold cash. But besides trying to get out their message, companies are also learning that blogs can provide early warning signs of potential problems. They are increasingly turning to firms that can help them sort through the blogorrhea to find what they need. There is a lot to sift, considering that some 27m blogs are online. Last month, responding to growing interest in their services, BuzzMetrics agreed to merge with Intelliseek, another firm that specialises in analysing blogs for business. BuzzMetrics has ties to Nielsen, a media-research firm; Intelliseek has a clutch of former executives from Procter & Gamble, a consumer-goods giant. Max Kalehoff, vice-president of marketing at BuzzMetrics, says that many of the firm's clients want it to analyse blogs so as to gauge the seriousness of bad news. Drugs firms, for example, want to know what questions are on patients' minds when they hear about problems with a medication. Car companies are looking for better ways to spot defects and work out what to do about them. The democratization of information unleashed by the internetÂnow increasingly connected to mobile phones and other portable devicesÂhas been gloriously chaotic. According to one count, 80,000 new blogs (online journals) are now created each day. But in 2006 more big companies will muscle in, and rules of sorts will start to spread. Participatory information sites and channels will blossom, with Âcitizen-reportersÂ busying themselves not only in writing and in sound through podcasting, but also with images using digital cameras and phones. As well as supplying leads and feeds for conventional media (witness the remarkable video images of the aftermath of last JulyÂs London bombings captured by surviving passengers on their mobile phones), these will develop their own mass through their range of reporting. And as corporations follow the example of Microsoft and others in buying into the blogosphere, sites will emerge with resources far beyond those of the original individual exponents of the genre. These mega-blogs will become part of an interconnected information universe that will increasingly move editing from the traditional newsroom to the recipientÂs computer. The essence of the original blogs was that they were individual expressions of information and opinion, however eccentric or extreme. This raised an obvious credibility question. Some blogs may have been accurate, but many more clearly come off the wall. For every dissection of the CBS report on President Bush and the National Guard, we had 1,000 rants and 100,000 accounts of daily activities of interest to nobody except the author. The limits of the free-for-all were well demonstrated by the chaos that resulted when the Los Angeles Times opened its online editorial page to unrestricted contributions. Such problems will encourage the growth of a more responsible online-information system that exploits the mediumÂs possibilities, but which also adheres to self-imposed standards that would have been seen as unacceptably restrictive by the original bloggers. The idea that the internet meant complete freedom will have to die in at least a part of the forest if the medium is to realise its potential as an information tool. Serious providers will have to accept that they are not free from responsibility. This will not come about primarily through any legal constraints, which remain cloudy in the blogosphere. Rather, a group of information websites will emerge from the world of blogsÂsmall in relative number, but weighty in impactÂwhich accept that the internet is not just a licence to peddle prejudices and pursue individual interests. The hierarchy of links pioneered by Google will become a key factor, discriminating in the good sense between the reliable and the dross, and creating a virtuous online circle. Thus can brands be built. This will present newspapers, already hit by declining circulations, with an extra challenge, and the growth of video and audio feeds from citizen-reporters will drive at least the smaller broadcasters to try to co-opt them as contributors. Conventional media enterprises will have to find creative ways of drawing on the proliferating sources of content and channels of distribution to satisfy their customers. If they do not adapt, fast, they may all too easily find themselves overshadowed as new media come of age, taking their responsibilities seriously and exploiting new ways of connecting with consumers.